Pacific Electric no. 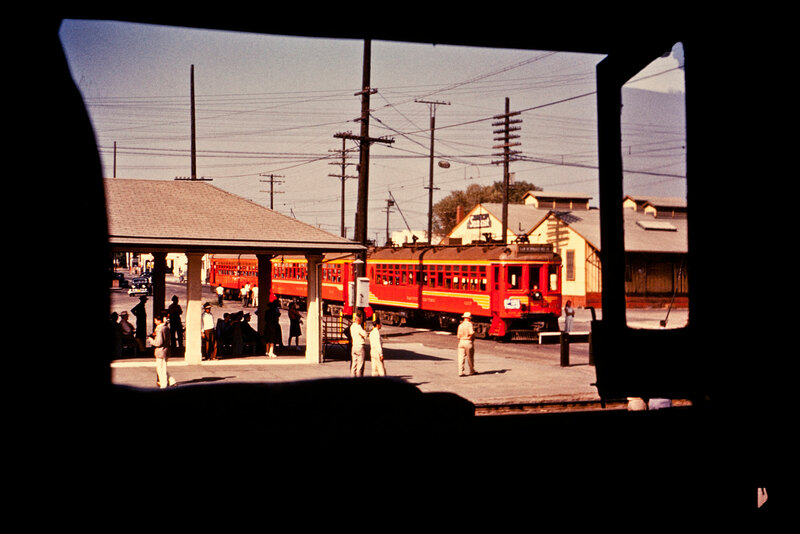 1217 and two other cars are captured standing at the Colton Southern Pacific station looking northeast. This image was shot by Robert T. McVay through the window of a Southern Pacific steam locomotive. Other slides from this series suggest the view is through the fireman’s window of a 5000-series three-cylinder steam locomotive. Interesting to note that the Sunkist packing house in the background was demolished to make way for Interstate 10. Southern Pacific’s Colton Station stood for many years after this photo was taken, and was demolished in 2012 to make way for the Union Pacific’s Colton Flyover project that crosses over the BNSF and UP main lines just west of this very spot. The packing house in the background is United Citrus Growers, according to a Sanborn map. The 5000-series is a 4-10-2 wheel arrangement known as a “Southern Pacific” type (different name on another road).